The term Home Improvement comes from renovations that improve your home. It is always important to work with a Licensed Contractor that will get the job done right the first time. Since your kitchen is probably the most important and utilized room in the home, you want only experienced Kitchen Remodeling Experts to work on your renovation project. Bannochie Builders, Inc. has a talented team that can take you through the entire kitchen remodel from concept to completion. Let us know what you envision for your Recreated Kitchen Space and we will work with you to develop the perfect plan that maximizes the space in your home. We can provide you with a more functional layout, ample storage and elbowroom. There are unlimited options available today that add style and function to a kitchen. Clever storage can be added with cabinetry, a pantry or a kitchen island. We are able to recreate your layout to make it more functional and accommodating with lots of elbow space. Flooring, lighting, countertops and a beautiful new backsplash will add plenty of style and allow you to put your own stamp on your newly created kitchen space. Contact Bannochie Builders, Inc. for your next home improvement project. 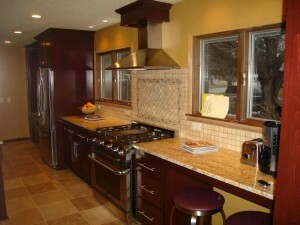 We are Kitchen Remodeling Experts with 20 years of experience in the Maple Grove, MN area. Our kitchen designer can help you to come up with the most functional and realistic design for your Re-created Kitchen Space. You can always trust Bannochie Builders, Inc. to provide you with high quality workmanship. This entry was posted	on Sunday, March 8th, 2015 at 4:26 pm	and is filed under Home Remodeling, Kitchen Remodeling. You can follow any responses to this entry through the RSS 2.0 feed. You can leave a response, or trackback from your own site.